Our work at the Wisconsin Innovation Kitchen is being incorporated into a wonderful effort to create jobs and new businesses in both rural and urban areas of Wisconsin. This food-based project is a collaboration between the Wisconsin Innovation Kitchen, Southwest Wisconsin Community Action Program and Milwaukee's Social Development Commission. Our Wisconsin Innovation Kitchen is one of three partner organizations in this effort. If this project comes to life, we are very much looking forward to working with Will Allen and his Growing Power organization, and the Multicultural Entrepreneurial Institute in Milwaukee. "The three partner organizations will identify existing and new small businesses involved in various aspects of healthy foods in Milwaukee. Each will provide technical business assistance and support to enable these businesses to expand and create jobs for low-income residents of Milwaukee. These partners are Growing Power, the Multicultural Entrepreneurial Institute (MEI) and the Milwaukee Business Improvement District #32. In rural southwestern Wisconsin, the main partner is the Innovation Kitchen, a state-of-the-art commercial processing kitchen." "Small businesses involved with the Initiative will be able to have the Kitchen buy the ingredients, store and prepare the recipe, package, label and ship it to Milwaukee." 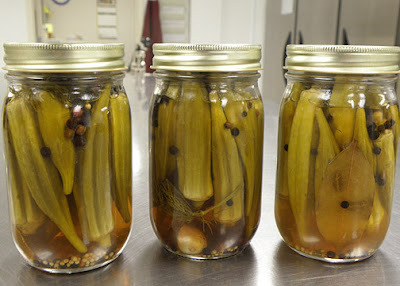 (Photo) Elegant Vegan's Piquantly Pickled Okra . Nice blog post about one of our partners and their wonderful products. Good quotes from the ever-wonderful Olivia Chase. Their amazing pickled okra is pictured above.